The photos below are of a little area that is between the main part of the backyard and the carport, which can be seen from the kitchen window. The wheelie bins sit by the wall of the shed, so when we’re doing anything in the kitchen the view is of the garbage bins. Not really the best view! 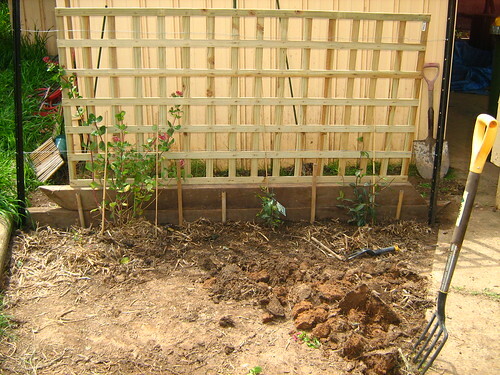 I’m really happy with this project because although I did purchase a few things (trellis, start pickets, plants) I was able to re-use a lot of things already on hand (sleepers, stakes, bamboo edging) instead of taking them to the tip! 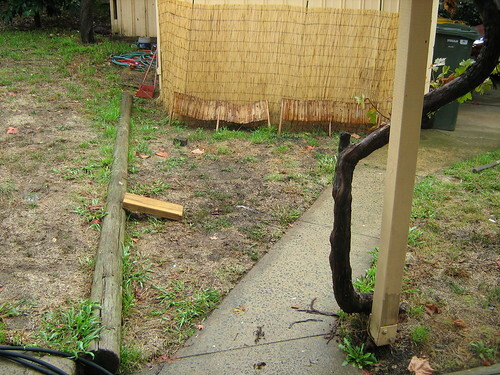 My first temporary fix was to attach some thin bamboo fencing to some garden stakes, which worked quite well until the dogs trampled through it then ripped it to pieces. I then decided screening plants would be rather nice to look at out the kitchen window, so bought 2 Star Jasmine climbers and one Firecracker climber. 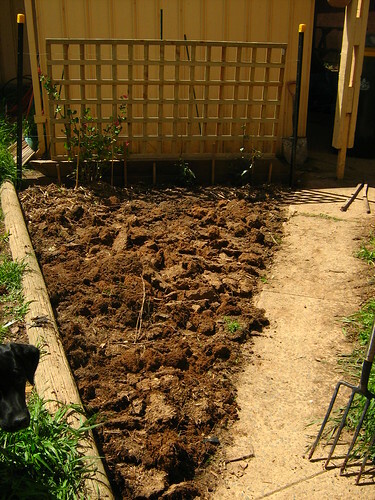 I dug out a garden bed about a foot wide and 10/15cm deep, then turned in some compost soil with blood and bone (to feed the plants) and Wetta soil to help with water retention, going into the hot summer. I then had to have some sort of frame for them to climb up, so I hammered in 2 star pickets and hung a length of thin gauge wire fencing between them. 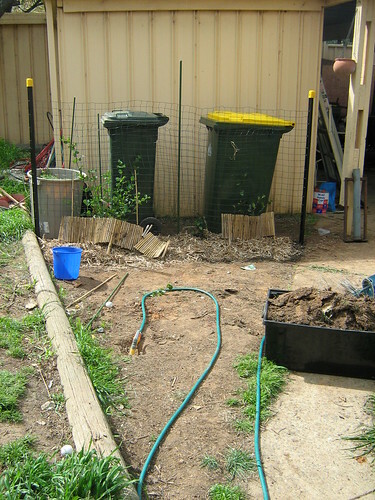 This in the end proved to be much too flimsy to hold the climbing plants, and the dogs also kept digging up the soil from behind where the bins are. I decided I’d need to build something quite a bit sturdier, but being on a tight budget at the moment, I couldn’t justify spending too much. 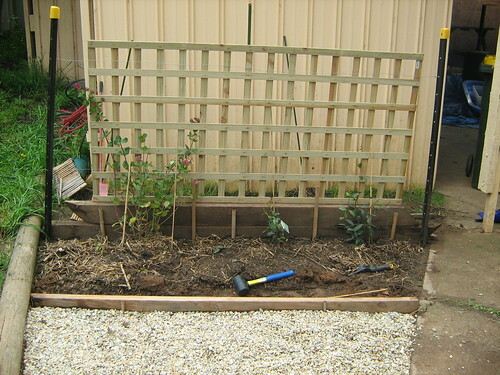 I went to bunnings and got a length of trellis for $11.50, and decided to re-use some old timber sleepers that had been lying in the carport since we bought the house. Because the length of trellis wasn’t quite long enough to reach between the star pickets (I didn’t want to move them again) I had to work out how to get it off the ground and how it was going to stay up. I laid one sleeper on top of another and hammered in garden stakes on either side to keep them upright, having also 2 long stakes coming up about 20cm over the top sleeper, and one very long metal garden stake in the middle (as seen in previous photos. 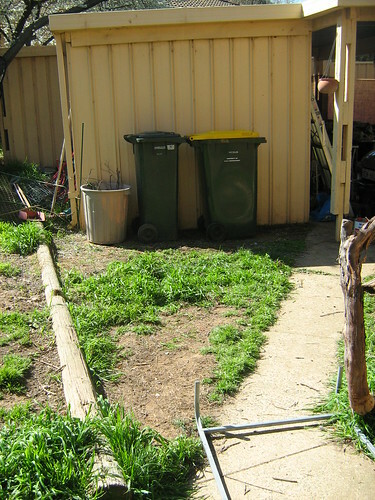 I then ran two lengths of wire (left over from making the cat run) between the star pickets. 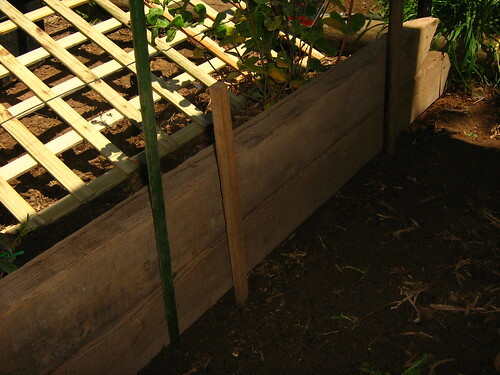 This then allowed me to place the trellis on top of the sleepers, in between the wire and the garden stakes. I used some more wire to secure the trellis to the wire and stakes, and there’s no way those doggies are getting that baby down! Once the trellis was up and the plants carefully tucked into it, it was time to dig out the soil from the grassy area in front of it (I had already removed most of the grass, pulling it out with the roots by hand). Luckily it’s been raining like crazy here and the ground is not too hard (had I done this in about 2 months it would have been impossible, like digging up solid rock). I needed to remove about 5cm off the top of the soil so the gravel would sit flat to the path once tipped in. 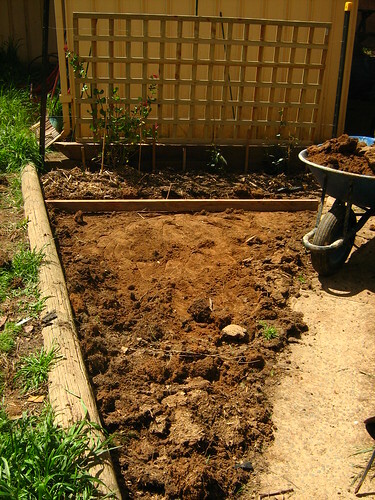 First I loosened all the clay soil by going over the whole area with a fork and lifting it. Then I just shoveled it all into a wheelbarrow and got husband to tip it on another area of the garden that needs a bit of filler. Once that was removed I used another piece of old timber (treated pine) that was lying around to give the garden bed an edge. 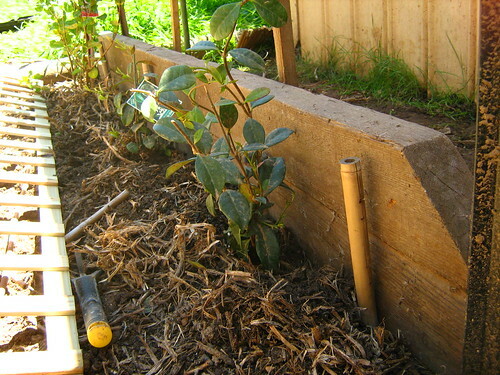 I used some old bamboo edging that was falling apart as stakes, and hammered these in in each side of the sleeper to secure it in place and keep it from falling over. 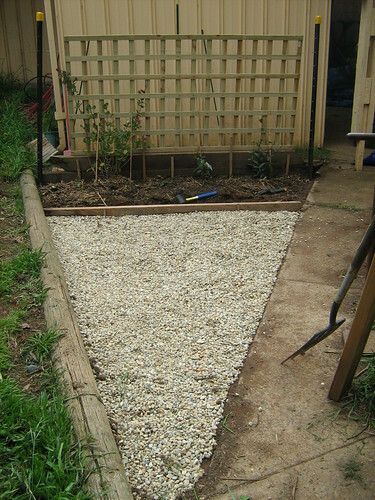 I then barrowed all the gravel into the area, raked it over, and stamped on it a bit to compress it down. And Vôila! Of course it will look much nicer when the climbers are a bit more mature, and I’ve swept the pathway on the right and trimmed the grass on the left! I’m also going to paint the yellow star picket caps black, so they are less noticeable. 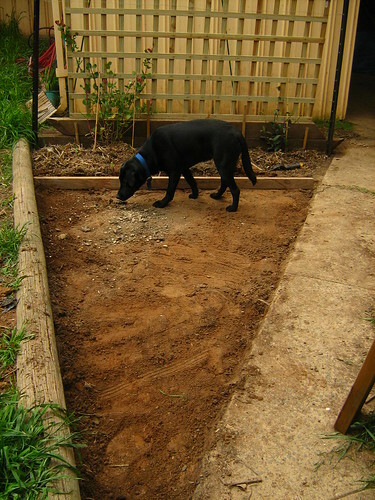 And here is the garden bed, which I will add more compost and top soil to, and also add a few little shrubs along the front. Photos to come, of course. The total cost of this project was approximately $75, including plants, gravel, star pickets and trellis. I think you did a very nice job. It really looks a lot better. I like your pics, too. Thanks. Wow, those pictures are so indicative of all the work that goes into doing yard work and something the slightest bit creative in your backyard. I know what you mean about the dogs – mine sabotaged several of my efforts and its a good thing I love him so much – eventually found a friend to take care of him so he wouldn’t get into so much mischief and keep me from my grand scheme! Thanks for posting this. Absolutely love these before/after home projects. Huge improvement for little expense. Well done. My hero! This is amazing and you have inspired me very much for my side fence project. 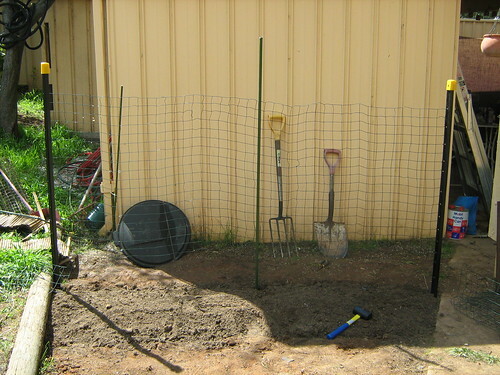 I was at both Flower Power and Bunnings today and am going to create my own wire grid to train some jasmine along. Good luck with your project!